In 1992, Nike aired a Super Bowl ad that combined Bugs Bunny, Michael Jordan, and a group of rowdy basketball players who harass poor Bugs Bunny (who was trying to sleep in his den under their basketball court). 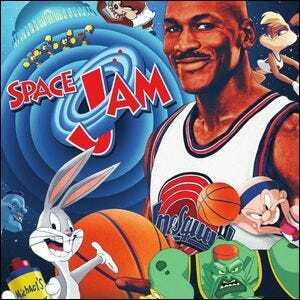 The sixty-second clip is filled with Looney Tunes style antics and, of course, Michael Jordan playing ball wearing his iconic Air Jordans (and, naturally, dunking baskets). The commercial wasn’t just a quirky moment in Super Bowl ad history though. It, intentionally or otherwise, yielded two outcomes. First, it made Looney Tunes look fresh and interesting again—while the franchise is more or less immortal, it wasn’t exactly a cultural hot commodity at the time. Second, it planted the seed of an idea: what if Michael Jordan actually did hang out with the Looney Tunes characters? That seed became the premise of the entire 1996 movie Space Jam, which offered an alternative timeline look at what exactly Michael Jordan was up to between his 1993 retirement from professional basketball until his comeback in 1995. In the real world, Michael Jordan pursued a brief career as a professional baseball player. In the Looney Tunes universe, he did the same thing, but instead of completing a year in the Minor League system, he was enlisted by Bugs Bunny to help train him and his Looney Tunes buddies in winning a basketball match against aliens bent on enslaving them in an intergalactic amusement park. The movie ends with a point that converges our timeline and that of the movie: Michael Jordan returns to the Chicago Bulls to continue his basketball career.